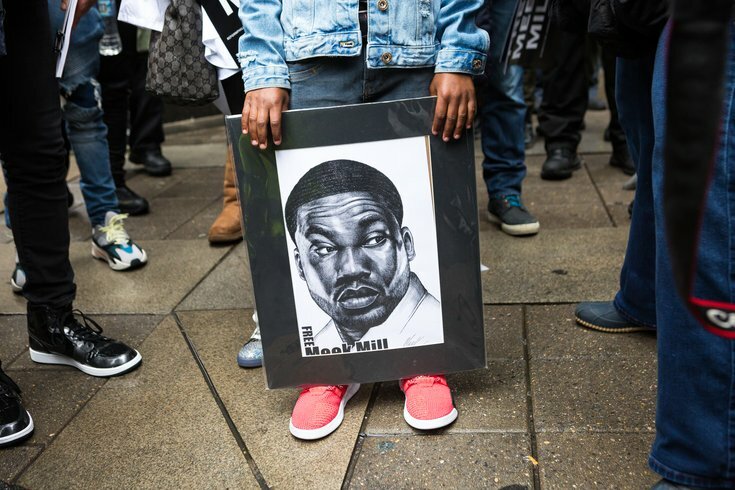 Meek Mill's son Rihmeek holds a drawing of his father outside the Philadelphia Municipal Court in Center City, Monday, April 16, 2018. Robert Rihmeek Williams, the North Philadelphian known to fans as Meek Mill, was not at the Criminal Justice Center on Monday morning. Even if he had been, Mill wouldn’t have walked out of the building to see droves of supporters outside who’d hoped he would, though. Still, the news out of Center City left his legal team – and those fans – elated. “The district attorney’s office concluded that they had evidence that this individual officer was involved in perjury since back in 2005,” McMonigle claimed just steps away from a stage adorned with a “Stand With Meek Mill” banner. The news wasn’t entirely good for Meek, though. Common Pleas Court Judge Genece E. Brinkley scheduled a new hearing for June, but the embattled judge refused to hear arguments about whether Mill should now be released on bail immediately. That meant defense attorneys would soon file papers with higher courts in an attempt to secure his release before the retrial. Noting that “about 50 cases” will be similarly affected, McMonigle said they were hoping “for justice for all the young men affected by this particular corruption." The “Free Meek Mill” movement has gained the support of elected officials from the governor and mayor to the district attorney and state senators, celebrities and much of the public. It’s been positioned as a case representative of a broken criminal-justice system that’s flawed and slanted against non-white defendants. That was the message coming from the stage outside the courthouse at 13th and Filbert streets, just one walking mile from where protesters simultaneously stormed the Starbucks location from which two black men were lead away in handcuffs four days ago. The protest started amid a windy downpour, but the skies gradually cleared during an event that prompted the installation of temporary security fencing along the front of the facility. “We’re not being soft on crime. We’re being strong on justice,” said Stack. He also noted that he’s co-sponsored legislation to, among other things, keep minor violations from putting people back behind bars. “We’re suffering under a system that’s painfully in need of reform, an oppressive system,” he said. Other speakers included Mark Lamont Hill, host of BET News, CNN political contributor and Germantown Avenue coffee shop/bookstore owner. He questioned how Mill could remain behind bars despite widespread support on the outside. For his part, activist Wallo267 spoke of spending more than half of his 38 years on earth behind bars for “slanging and banging” but has now fashioned his life as a cautionary tale for youths. “You would have thought Meek killed somebody,” he said of being in the courtroom for one of Mill's hearings at the rapper's invitation. “Yet, they get McDonald's for a white man after killing nine people at a Southern Baptist church. Protesters – including 20 teens in town on a community service trip from Boston – braved the conditions as speakers rained down criticism on Brinkley and the system itself. Among the teens in that group was Ky’ann Horton, who ripped his shirt off and danced in Filbert Street after breaking news of a new trial led into an edited version of Meek’s “Dreams and Nightmares” – the song to which the Eagles ran onto the field at Super Bowl LII – blasting through the speakers. His friend, Alexandria Funches, concurred when asked if she’d seen the viral video of the Starbucks incident from across town. “I haven’t, but it doesn’t surprise me,” she said. “This happens to us all the time. Just because of my skin color, certain people won’t sit next to me on the train because they feel scared. But, it’s just me. I can’t change it, and even if I could, I would never change it. For all the pro-Mills chants echoing up Filbert Street on Monday, one stood out as powerful. As the protests were wrapping up, cameras circled around Meek’s mother, Kathy Williams, and his namesake six-year-old son, who held a drawing of his father. “Free Meek Mill,” said the youngster before thanking his father's legal team at his grandmom's prompting. Among those who were inside for the hearing was Michael Rubin, co-owner of the Sixers who has long stood behind Mill. “Meek Mill stands for freedom and the changes necessary in the criminal justice system,” he said. “The news that he’s getting a new trial is amazing. We knew it was coming. We heard that the DA’s office knew that (arresting Officer) Reggie Graham was dirty since 2005. It’s absolutely preposterous that evidence can be held back for 13 years while he’s been tortured by the criminal justice system. “That said, he’s going to be out any day now," Rubin said. "I’m comfortable that the overall criminal justice system will step in and do the right thing. This is one bad judge that will get corrected, but it’s a big day for Meek." Then, Rubin shared a conversation he'd had with his 30-year-old friend.